An application for which DeskPoto is very suited is creating thermoforming molds. When thermoforming a heated sheet of plastic is formed over a mold, using vacuum (or in fact atmospheric pressure) to press the sheet against the mold. DeskProto-user WAA Groep in Venlo, NL, applies thermoforming to manufacture custom packaging for a large number of clients. Using thin transparent sheet, WAA mainly produces blister packaging, where the product inside is clearly visible. Thermoforming mold, and the resulting packaging that was created using this mold. As molds for thermoforming have only one side (the other side of the sheet is formed by air pressure) and as undercuts are not allowed, these molds are relatively easy to manufacture. 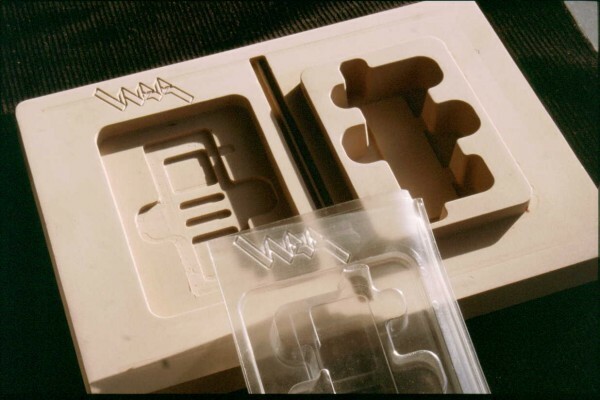 WAA in fact uses two different molds: one rapid mold in tooling board for a prototype series, and later a production mold in aluminum for the large series. The prototype mold has to be created very quickly, hence DeskProto is used. The production mould are later created on a different department, using a different machine and different CAM software tools. The mold with the formed product and a detail showing an undercut. Though in theory undercuts are nor permitted for thermoforming, in practice some are nevertheless possible. An undercut is an area where the cutter (of a 3 axis machine) cannot reach because of overhanging geometry. Such area in the mold means that the product cannot be removed from the mold when it's ready. Still with some small undercuts it remains possible to remove the product from the mold. See the illustration above (right): the bulb and hole on the side of the pack correspond, and after closing they lock into one another to keep the box closed. They have been machined using manual control, as DeskProto does not support undercuts. This is quite easy: using a real ball-formed cutter, with the ball attached to a thinner shaft. The resulting packaging. It remains closed because of the locks. Being able to send the prototype series (a few thousands of products) to the client very quickly, has given the WAA Groep an important competitive advantage over other suppliers.